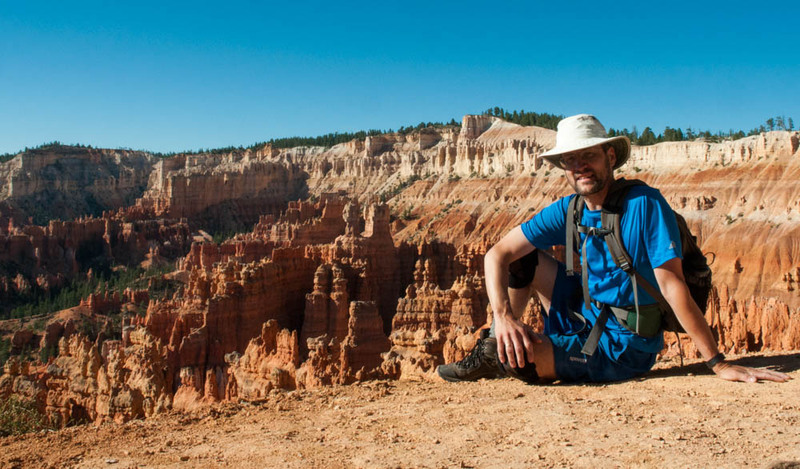 David pauses on his hike around the Bryce Canyon Amphitheatre, at some point between Sunset and Inspiration Point. It’s not many days that I realize, before lunch, that I’ve just completed one of the most beautiful hikes ever. Even more amazing to have that experience at the end of two weeks hiking in spectacular canyons around the Four Corners region. Today was such a day. Bryce Canyon at sunrise is so spectacular that I snapped hundreds of photos and found it difficult to select only a few favorites. Read on. It’s not a long drive to Zion Canyon National Park from the north rim of the Grand Canyon, but it’s a different world – the typical visitor to Zion visits the park from the floor of the canyon along the shores of the Virgin River, whereas the typical visitor to the Grand Canyon views the canyon from the top, either the north or south rim. 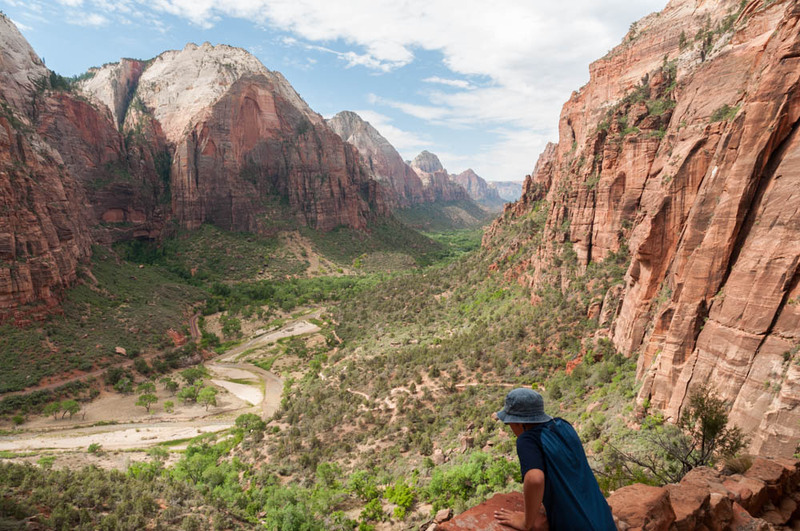 Having come recently from a trip along the river in the Grand Canyon, winding down through eons of geologic time and with a different vista around every bend of the river, Zion at first seemed less than ‘grand’. Nonetheless, it’s a stunningly beautiful place – check out the photo gallery, and read on for more. Andy leans on the railing overlooking Zion Canyon, along the trail to Angels Landing, Zion NP. We returned to the Grand Canyon to visit the North Rim for one night in the cabins at Grand Canyon Lodge. This gorgeous mountain lodge sits right on the rim of the canyon with a fine dining room and outstanding views from the nearby Bright Angel Point. This visit gave us a totally different perspective on the Grand Canyon, as we stopped by each of the roadside viewpoints. Just three days earlier we bobbed down the Colorado River at the canyon bottom, rarely able to see farther than the adjacent canyon walls or the next bend in the meandering river. Now we had sweeping views across the canyon, and could only catch glimpses of the river far below. Read on for more about our visit, and check the photo album. 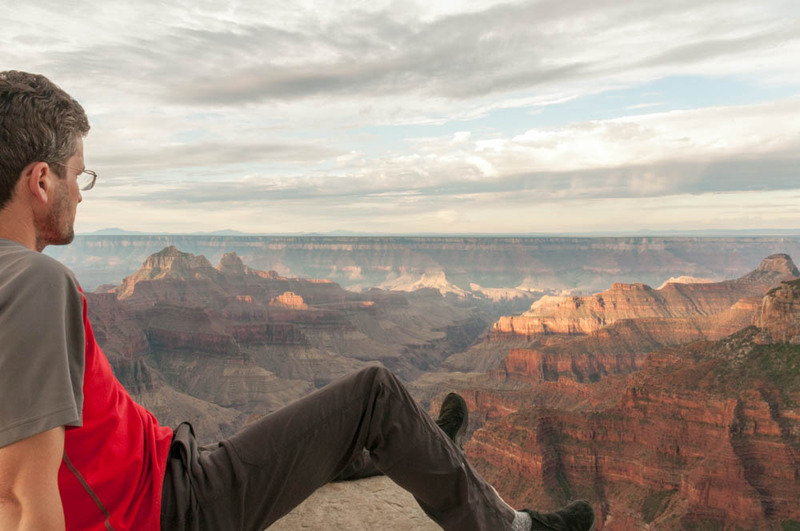 David watches the sunrise from Bright Angel Point, North Rim, Grand Canyon. While visiting the North Rim of the Grand Canyon, I took a short hike around the loop of Uncle Jim’s Trail, and caught on video one of the most amazing wildlife scenes I’ve ever witnessed – involving a deer, a fawn, and at least one coyote. Read on, and watch. After our visit to Mesa Verde, we made the long drive westward back to the Grand Canyon – this time to visit the North Rim and look across the sweeping views that we’d missed while floating along the river down in the canyon. 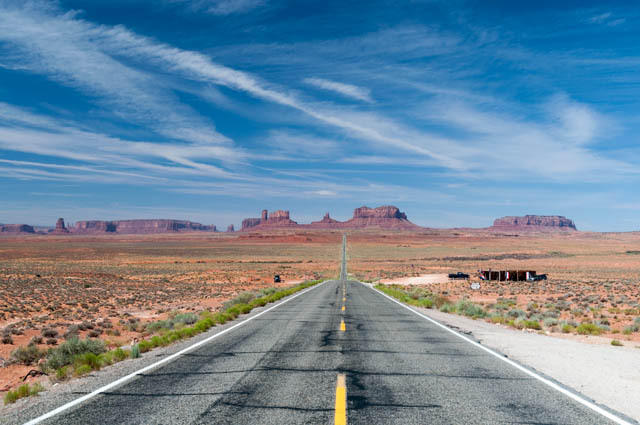 It being only slightly out of our way, we drove through Monument Valley (along the Utah-Arizona border) to see some of that famous scenery. It turns out that the most-famous bits are off on a side road, which we didn’t realize until too late, but the scenery was nonetheless spectacular (see photos). We arrived at the North Rim early enough to visit all the outlooks, but I’ll write about that in the next post. Driving through Monument Valley; some craft vendors set up alongside the road. After the rafting trip we were eager to visit several of the outstanding National Parks in the region. After doing our laundry at Marble Canyon, where we reconnected with our car, we drove east to Four Corners (to snap the obligatory photo at the junction of Arizona, New Mexico, Utah, and Colorado). 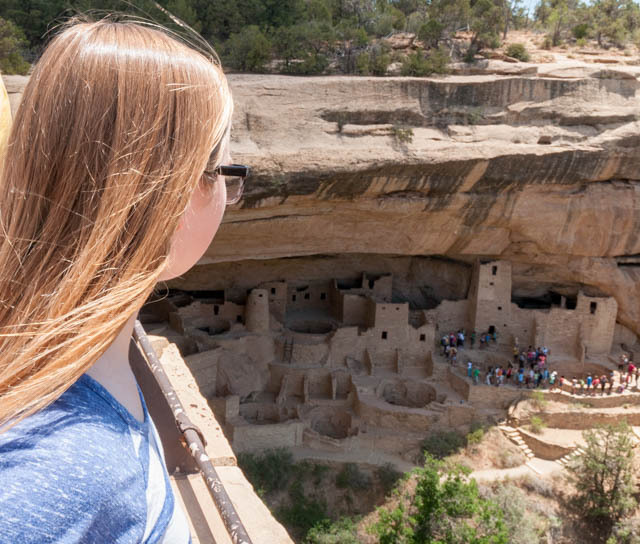 A couple hours further east, we arrived at Mesa Verde National Park. 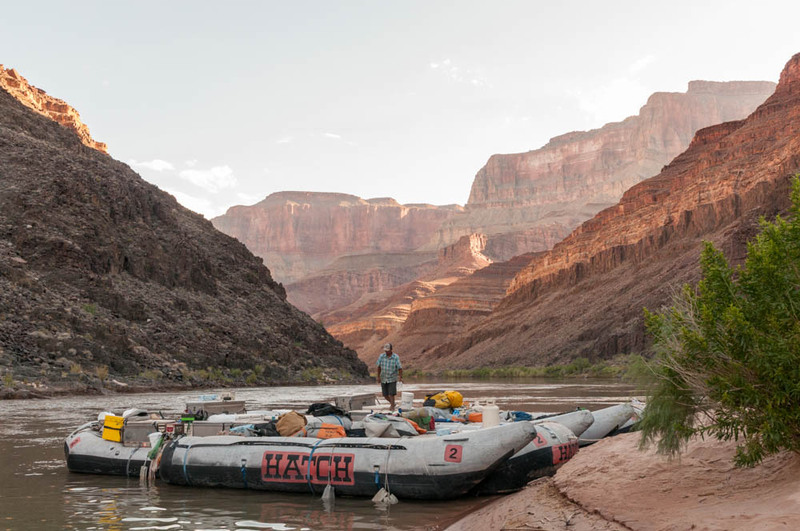 JP readies the boats as the morning sun paints the canyon walls behind; Camp 4.